It's November but before you know it snow will be on the ground and your shoes will be unprotected. With the moisture from snow and slush, along with salt being used everywhere, your shoes will take some punishment. But have no fear, we have tips to help preserve your shoes as much as possible during the winter season. If you have a canvas shoe, you can waterproof it with some beeswax and make the snow deflect right off your foot. It is a simple and effective way to preserve your canvas shoes for the winter, To see the original post, click here. Another tip to keep in mind during the winter is to clean off the salt from your shoes. This can ruin leather, and also leave salt marks on your boots. You can check out our post from earlier this month to fight those pesky salt marks. GQ Magazine suggests that you use a water and white vinegar mix to clean. Salt marks can make your shoes and boots look much more ragged than they are. 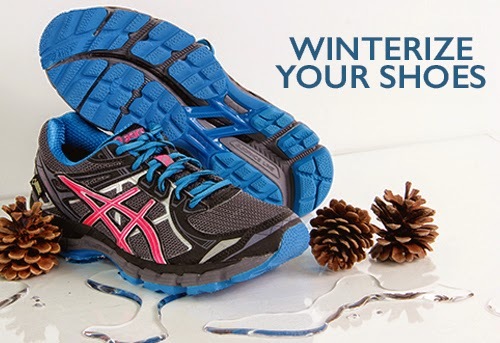 For winter runners, invest in some waterproof shoes to help make your runs more comfortable in the outdoors. While they may be heavier, running in wet shoes is often more uncomfortable. You may want to think about how the ankle is protected too in winter running. The Asics GT-2000 GTX for women is a shoe that offers a lightweight option while providing a waterproof shoe. Prevention is one of the biggest things you can do for your shoe to make sure it makes it through the winter season. You can also purchase sprays or kits to help protect your shoes. Be sure to check out our online selection to find waterproof shoes at Roganshoes.com.